Sustainable, fresh ingredients take center stage at this Resort at Squaw Creek restaurant. 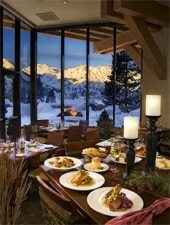 : Six Peaks Grille at Resort at Squaw Creek features modern California cuisine with a focus on local and regional ingredients, from seafood to beef, and organic, farm fresh vegetables. Olympic Valley scenery is part of the main course --- the resort restaurant gets its name from the six mountains that soar above the valley. There’s not a bad view from any table, particularly at sunset. But for a summer night to remember, opt for one of the patio tables situated next to the roaring fire from which to enjoy a vine salad with tangelo and strawberry, or a surf ‘n’ turf with Maine lobster and wood-grilled filet mignon. Area denizens return often for the coffee-crusted duck served with green apples and huckleberries, or red snapper paired with pancetta and Serrano ham. Finish the night with the chocolate lava cake. Six Peaks boasts an extensive wine selection with offerings from both its standard list and reserve labels from the cellar. A kids’ menu has burgers and chicken fingers as well as small portions of pan-seared salmon or grilled steak.